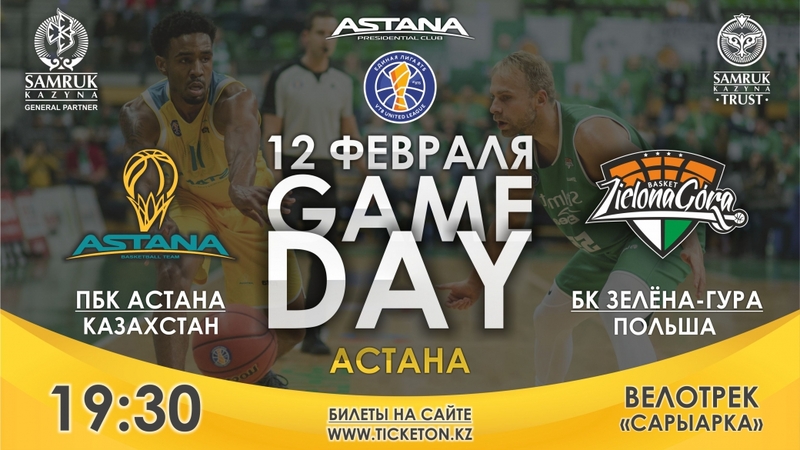 On February 12th, Tuesday, the home match between the Presidential basketball club «Astana» and the Polish basketball club «Stelmet Zielona Gora» will be held at the Republican cycle track «Saryarka» within the regular VTB United League championship. «Stelmet Zielona Gora» - is a Polish professional basketball club from Zielona Góra founded in 1946. For the Poles, this is the first season in the VTB United League. On October 29, the capital basketball club had already met with the Polish team on the road, and Astana had its first historical match on Polish soil, having won with a score 91:82 (23:14, 20:21, 26:18, 22:29). “Zielona Gora” has been demonstrating a very high-quality game throughout the season and clearly goes to the capital of Kazakhstan for revenge. The match will take place on February 12th at the arena of the Saryarka Cycle Track, beginning at 7:30 pm, Astana time. Online tickets are available on Ticketon.kz. Live broadcast of the match will be available on our website in the Match Center section and on the QazSport TV channel. We kindly remind you that prize drawing among the spectators will take place at the match.